"Yummy and delicious. 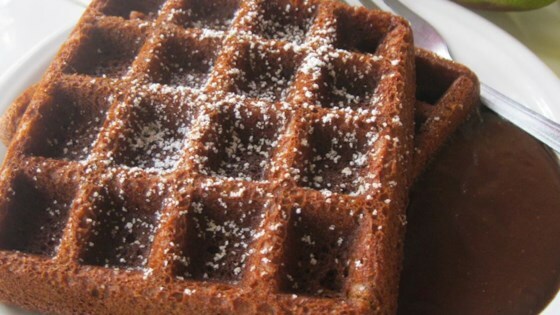 These extraordinary waffles are flavored with molasses and spices. Topped with homemade chocolate sauce, they are perfect for a special breakfast treat." In a small saucepan, heat molasses and 1/2 cup butter until almost boiling. Remove from heat and let cool slightly. Stir in baking soda, milk and egg. In a large bowl, sift together flour, ginger, cinnamon and salt. Make a well in the center and pour in the molasses mixture. Mix until smooth. Spray preheated waffle iron with non-stick cooking spray. Pour mix onto hot waffle iron. Cook until golden brown. Serve hot with chocolate sauce. To make chocolate sauce: In a saucepan, combine water, 1 cup sugar, cornstarch, cocoa powder and 1 teaspoon salt. Cook over medium heat, stirring constantly, until mixture comes to a boil. Remove from heat and add vanilla and 2 tablespoons butter; stir until smooth. A nice change from the ordinary, however the gingerbread texture tends to make these waffles not as light as waffles usually are. The kids loved this when we served it as one of the dishes at our Christmas Eve brunch. It had to be the all time hit for the kids. I thinned the batter some though and it seemed to work well. Was not what I expected or was hoping for. Very thick and heavy...nothing light and fluffy. Would not make.